It's that time of year to celebrate St Patricks Day! 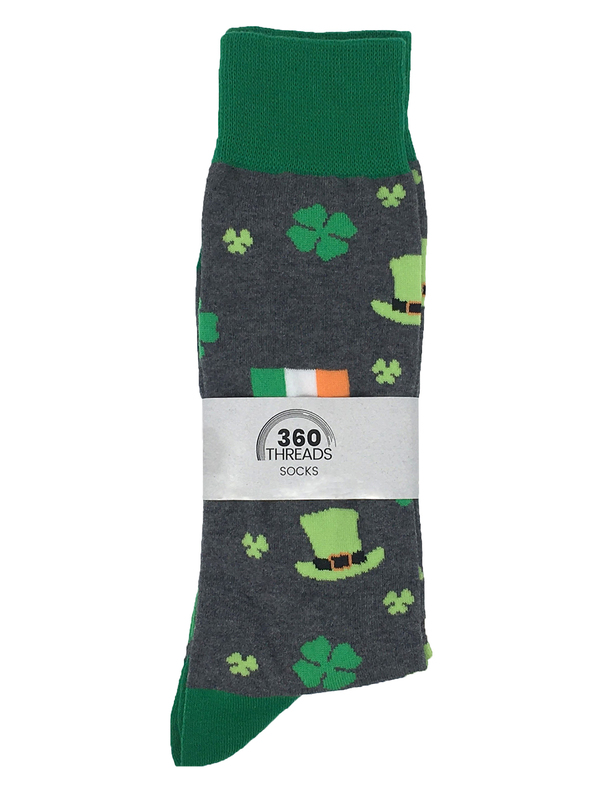 Sport these grey novelty socks with Irish flags, hats and 4 leaf clovers. Men's St Patricks Day Irish Clover Socks Size 10-13 Grey. 1 Pair of Gray Novelty Trouser Socks for men with an all-over print of Ireland flags, 4-leaf clovers and green top hats with green cuff, heal and toe. All-over detailed graphic print. 360 Threads socks are made with lightweight blended fabric constructed of Cotton, Polyester, and Spandex. this combination of materials creates durable and comfortable socks. 360 Threads come in designs to fit any outfit or event. Wear for business or fun - they are stylish, cozy and humorous. Make the perfect presents for friends and family on their birthday, Christmas, Father's Day, Graduation, Wedding (Groomsmen), Bachelor Party and more. Sock sizes are 10-13; mens shoe sizes 6-12. They are One Size Fits Most socks that are made with spandex so they will stretch to fit your foot.